Winter was halted momentarily this morning on the final day of at the RORC Easter Challenge when the sun broke through, raising the ambient temperature on the Solent above freezing for the first time this weekend. Combined with more 15 knot winds, Easter Sunday’s two races provided the perfect conclusion to the Royal Ocean Racing Club’s UK season opener and training regatta. Scoreboard stars were once again David Franks and his JPK 1010, Strait Dealer in IRC Three. Their two wins today saw them conclude the regatta with straight bullets across the event’s seven races, a repeat of Strait Dealer’s scoreline last year at the IRC Nationals. Franks attributed his success to his crew and also to the time they have spent sailing Etchells between RORC races. Many new crew were aboard Strait Dealer for this regatta, with regular hand, Graham Sunderland, joined by Ben Ainslie’s coach and keelboat legend David Howlett, ex-Team GBR squad sailor Bleddyn Mon calling tactics and several members of the British Keelboat Academy. 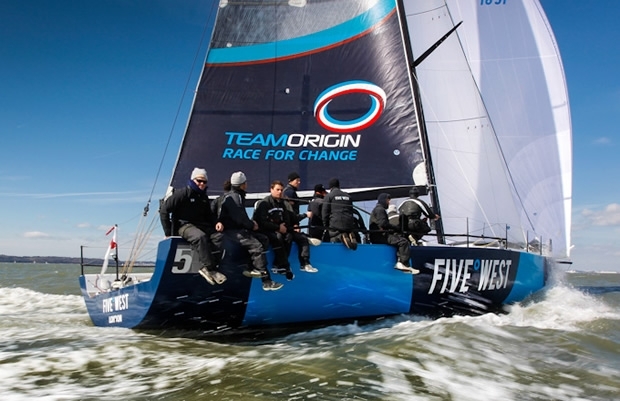 The winner of IRC 1 also scored two bullets today - Sir Keith Mills’ TP52 5°West also claimed the overall prize in the big boat class in what is the first regatta for the TeamOrigin boss as an ‘owner driver’. “The objective of the weekend was to get better and these guys are great coaches - when you have a crew of this calibre driving is easy.” admitted Mills, pointing to the small army that sails 5°West, led by three time Volvo Ocean Race sailor Robert Greenhalgh and including Laser gold medallist Paul Goodison on tactics. “It has been a great end to a very cold weekend. It has been fantastic – a steep learning curve for me, but a lot of fun and it will be more fun when it warms up by another 10 or 20°C!” Mills plans to helm his TP52 in many more regattas in the UK this year. The rising intensity of competition between 5°West and the Farr 52 Toe in the Water, and between the three Farr 45s and Ker 40s was best indicated in today’s final race when a dog fight on the line led to a general recall. Between the speedy trio of Ker 40s, it was Andrew Pearce’s white-hulled Magnum III that came out on top, finishing second overall in IRC One, six points ahead of Edward Broadway’s Hooligan VII. Runaway leader in IRC Two was the King 40, Tokoloshe, of South African owner Michael Bartholomew. With a 3-1 scoreline today, the Hamble-based crew podiumed in all seven races this weekend to finish 15 points clear of second. Holding this position, albeit tied on points with Anthony O’Leary’s Ker 39 Antix, was the top female skipper at the regatta: Jackie Dobson, helm of the Poole-based J/133, Jeronimo. In IRC Four, Peter Schofield’s HOD35 Zarafa dominated and like 5°West and Strait Dealer won both today’s races. The Lymington-based team finished 6.5 points ahead of Altura & Steamy, the First 34.7 campaigned by Neil Cash and Nick Haigh. For the Plymouth crew it was a strong learning experience, assisted by RORC Easter Challenge coach Jim Saltonstall and his team. “Training-wise, we had a mix of people and we hadn’t sailed as a team before so it was great to learn about the trim and sail shapes and how to hit buoys in a lot of tide!” said Haigh. At the prizegiving this afternoon in Cowes Events Centre, class winners were presented with their prizes, including a stockpile of Easter eggs. Diverse Yachts has moved location. You can now find us at Unit 3, Compass Point, Ensign Way, Hamble.